Living in Hong Kong can get a little claustrophobic at times – cars and buses on every street, surrounded by steel and concrete, it can be hard to remember that 80% of Hong Kong is green. Don’t forget to make your apartment or workplace just as green! Some well-placed plants can make all the difference, not only will it brighten up an area but it will also cleanse the air. Studies have shown that having an indoor plant reduces stress levels compared with people who don’t have any indoor plants. You don’t have to be green fingered to grow these three plants, if I can, then anyone can. Aloe Plant – everyone knows Aloe Vera is great for the body. The gel in the aloe has numerous healing properties. It’s good to put on your skin after bad sunburn (which hopefully you don’t get too often – those who know me well know about my personal loss to skin cancer) It can also help you monitor the air quality within your office or home. Watch the leaves carefully, if they turn brown it means they have detected harmful chemicals in the air. Rubber Trees – rubber trees are exceptionally good at cleansing the air and are a very easy plant to grow. They thrive in dim lighting and cooler climates – perfect for not so bright HK apartments with air-con! Think of it as a natural toxin eliminator and air purifier. Bamboo Palm – us locals love this plant. It is even on NASA’s list of top clean-air plants! The attractive trait of a Bamboo Palm is that it is effective at clearing out benzene and trichloroethylene in the air – toxins you do not want floating around! So where do you find these plants? My favourite place is on the darkside at the flower market but you can pick them up at any local florist or wet market. Whilst we’re talking green, did you know that JLL has an Urban Farming initiative? 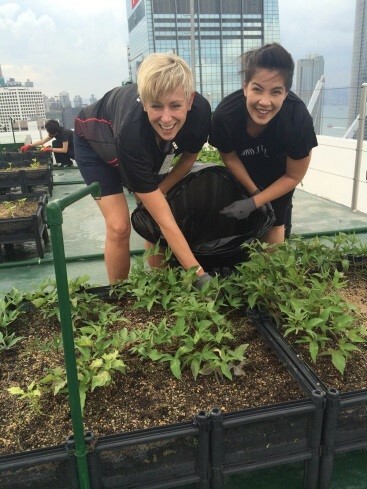 It’s a joint venture with Time to Grow and our goal is to make Hong Kong a bit greener by allowing small groups at a time to cultivate vegetables (whilst enjoying a fantastic view!) on top of the Bank of America Tower. I was there volunteering not too long ago and it’s always a great experience. Last time, I brought along a few of the residential team and we had a great afternoon of fun in the sun whilst doing our bit to keep the 852 green! Next Wan Chai – East meets West in more ways than one. Nice. Hk needs more green.